The OSHA definition of workplace or work environment is primarily composed of: (1) The employer’s premises and (2) other locations where employees are engaged in work-related activities or are present as a condition of their employment. The employer’s premises encompass the total establishment. · The employee’s normal commute to and from work is not considered work-related activity. · For recordkeeping purposes, company parking lots are part of the employer’s premises and therefore part of the establishment. OSHA has clearly established that a restaurant employer has a duty to provide a safe, healthy, and secure working environment and, at times, that also extends beyond the four walls of the restaurant building. Wherever an employer sends restaurant employees to do work, it must be made as safe as reasonably possible – even if the work is taking place away from the restaurant establishment’s premises. Two classic examples of this include: 1). A pizza delivery driver, and, 2) a member of the kitchen staff running to the market to pick up fresh fish. With that said, yes, an employee’s own vehicle used for delivery driving or to pick up goods can be deemed to be a piece of work-related equipment; and, therefore, it too must be maintained in a manner that would be considered reasonably and customarily safe, healthy, and secure for the employee to use for work on behalf of the employer. 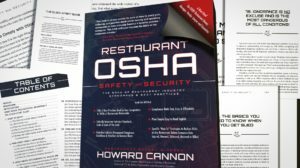 For more information on how OSHA applies to restaurants and bars, visit RestaurantOSHA.com. If you would like to know more about Restaurant Expert Witness – Howard Cannon and the expert witness services he provides, please visit RestaurantExpertWitness.com.